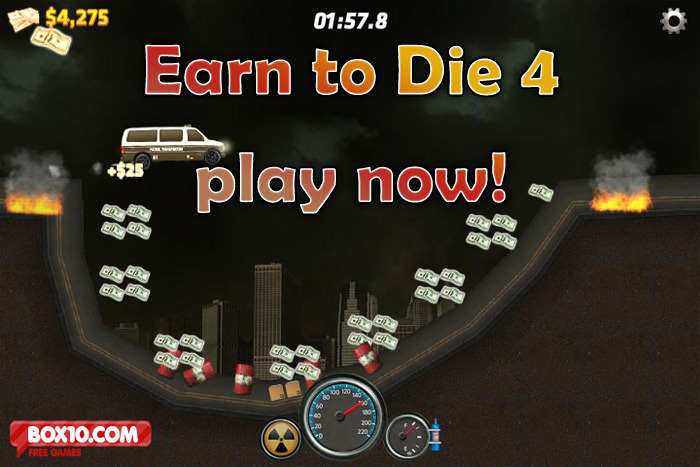 If you love race-against-the-clock games, then you are going to have a blast playing Earn to Die 4! Packed with tons of excitement, upgradable parts, and loads of fun, you’re sure to spend hours playing and replaying this game! 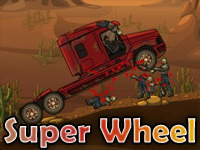 Test your driving skills now! 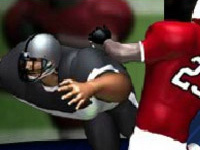 Race the clock and make it to the goal line before the timer runs out. Use the cash you earn to upgrade your vehicles parts or purchase a new vehicle in the garage. 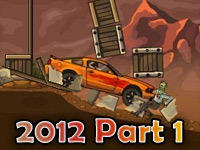 Unlock achievements and earn bonus cash by completing the level in the shortest amount of time possible, performing stunts, breaking barrels, and knocking down signs along the course. 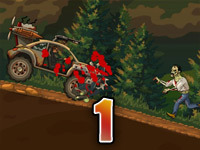 The controls in Earn to Die 4 are slightly more complicated than they were in previous versions like http://www.earntodie5.net/earn-to-die-1/ . The primary controls are the same – press the up arrow key to accelerate, press the down arrow key to brake, press the left and right arrow keys to control the vehicle’s tilt. However, in addition to these basic control functions, you will also need to press the spacebar to activate the nitro booster, press the H key to use the horn, press the P key to pause the game, and press the R key to reset the game. 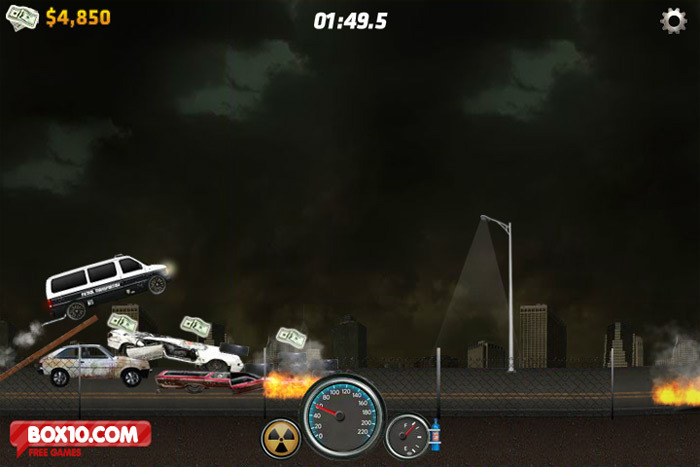 Resetting the game causes an amazing display – it blows up your car! 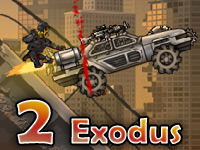 There are four cars available for you to use in Earn to Die 4 – a highway patrol car, a patrol transport van, a traffic enforcement truck, and a standard police car. 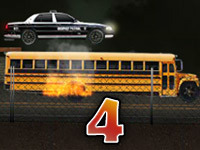 You begin the game with the highway patrol car. 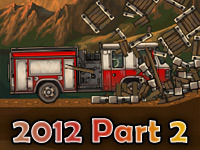 When you’ve completed the first three levels of the game with full stars, you can then unlock the patrol transport van. 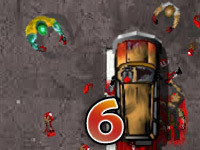 After completing level 6 with three stars, you can unlock the traffic enforcement truck, and when you’ve completed level 9 with all three stars, you can unlock the police car. Achieving three stars is quite easy if you upgrade your vehicles parts frequently. 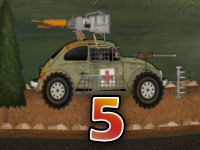 In Earn to Die 4, there are eight different parts that you can upgrade to receive the maximum benefits for your vehicle. Some parts can be upgraded up to four times, while others only two or three times. Each upgraded part offers a different benefit. Suspension – There are three upgrades available. Each upgrade increases the chassis height which improves the vehicles stability. 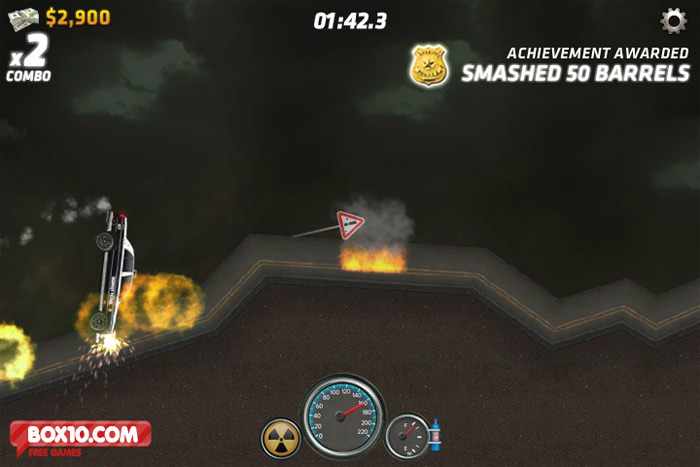 Nitro – Increases the amount of boost your vehicle will receive. Includes small, medium and large upgrade tanks. Weight Reduction – Decreases overall weight of the vehicle which increases all vehicle parameters. Includes three upgrades. Gearbox – Improves the vehicles acceleration. Includes four upgrades. ©2019 Earn to Die 5. All rights reserved.